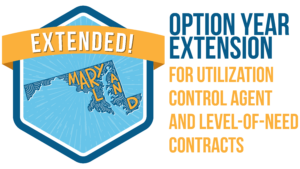 In recognition of the continued collaboration and performance resulting in improved outcomes provided to Maryland’s Medicaid beneficiaries, the Maryland Department of Health has extended two contracts with Telligen. Telligen has been providing services to the Medicaid unit since February 2016 as its Utilization Control Agent (UCA) in addition to providing Support Intensity Scale (SIS®) assessment services for the Developmental Disabilities Administration (DDA) since September 2017. The UCA contract scope of services includes on-site minimum data set validation at long-term care facilities, in-person assessments and more than 50,000 reviews per year related to inpatient admissions. Telligen engages with the provider community and stakeholders through continuing education offerings and communication. Providers are able to enter requests and check status on their requests in Telligen’s provider portal. The agency also provides prior and continuing authorization for services within the inpatient, long-term care and home and community-based services. The DDA contract scope of services include in-person assessments utilizing the Support Intensity Scale (SIS®) interview tool. The interviews are conducted by using the American Association on Intellectual and Developmental Disabilities (AAIDD) nationally recognized SIS® assessment which allows the DDA to gather consistent information about people’s support needs. The DDA utilizes information from the SIS®, along with other factors to determine support levels, as part of the person-centered planning process.